Capt. Art Neuenhaus died of congestive heart failure at the Manor Care Rehab Center in Fort Meyers, Fla. Art is survived by his wife, Alexis; three children (Glenn, Wayne, and Pam), and four grandchildren (Amy, Kyle, Phillip, and Matthew). He and Alexis were due to celebrate their 30th wedding anniversary this Aug 27. The following memorial tribute was contributed by Capt. Tom Reinke. I think Art would like to be remembered by SPAR members as an able aviator whose record speaks for itself. Art achieved the enviable position of B-747 Captain in 1980. He had also flown as DC-8 Captain at Seaboard. Originally hired as a Flight Engineer by Seaboard World in 1962, Art transitioned to the pilots seniority list in 1965. I will always think fondly of the times I had with Art, especially when we would recall people, places, and events related to Seaboard's storied history. His special way of relating, as a raconteur, those memories always resulted in a vigorous bouts of laughter which I will always be glad to recall. I was proud to be included as his friend and as my friend he will be sorely missed. Go direct my friend. You're cleared for a straight-in. Happy Landings. Capt. 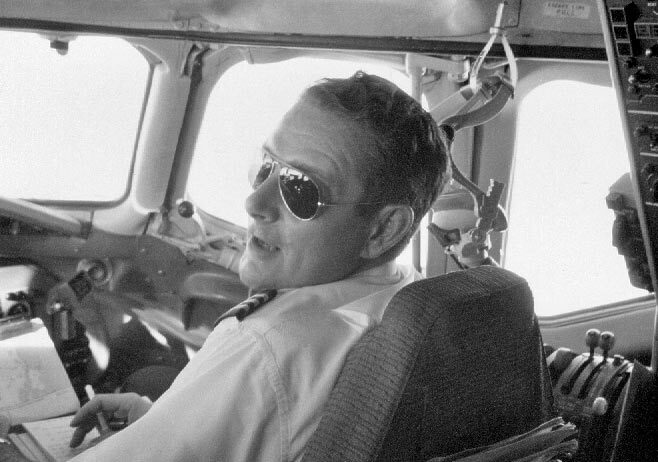 Art Neuenhaus is seen here in the cockpit of a DC-8.